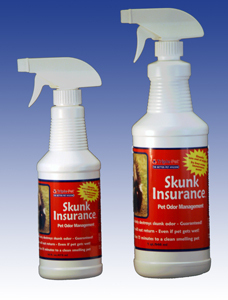 Triple�Pet Skunk Insurance™ immediately destroys skunk odor (skunk oil) on contact. It breaks up the sulfur compounds, so the odor does not come back, even if the pet gets wet. Fast acting, less than 15 minutes to a clean smelling pet. Skunks come out at night, when the store is closed. A bottle of Skunk Insurance on the pet owner�s shelf is true insurance. Skunk Insurance can be used to eliminate odors from hard surfaces and fabrics. It is hypo-allergenic, non-toxic, odorless and does not stain. It is non-masking. That is, Skunk Insurance destroys skunk odor, it does not mask it. Available in a 16 and 32 oz bottles.